Bent’s Old Fort National Historic Site brings to life the wilderness of 150 years ago, with faithfully reconstructed buildings and costumed re-enactors in character as traders, travelers, Native Americans and craftsmen. The original adobe fort was built in 1833, the only permanent white settlement on the Santa Fe Trail. Brothers William and Charles Bent and Ceran St. Vrain built the fort with the intention to trade with Cheyenne, Arapaho, Kiowa and Comanche and white trappers. Among the who’s who of Western icons visiting the fort was hunter and Bent employee Jean Baptiste Charbonneau, the son of Sacajawea, who had accompanied his mother on the Lewis and Clark expedition. Frontiersman Kit Carson was employed as a hunter by the Bent brothers. The fort quickly became the hub of travel and trade on the Santa Fe Trail. The Bents and St. Vrain expanded their business to Fort St. Vrain to the north and Fort Adobe to the south and stores in Taos and Santa Fe, which were then in Mexican territory. For 13 years the fort was the scene of peaceful trading among a diverse group that included homesteaders from the East, Native Americans leading ponies loaded with buffalo robes, ambitious traders driving wagons laden with supplies for the new settlements popping up, and Mexican businessmen eager to exchange goods. When the Mexican-American War broke out in 1846, the fort served as a staging area for U.S. troops of the Army of the West as they headed toward battle. When the war ended in 1848, the U.S. government withheld payment for housing and supplying its soldiers. A cholera epidemic and increased Indian attacks on travelers on the Santa Fe Trail combined to reduce business at the fort. William Bent offered to sell the fort to the U.S. Army but was turned down. Frustrated, Bent reportedly set fire to the gunpowder room and much of the fort was destroyed. Enough remained to serve as a stage stop and post office, but the fort was in decline. Farmers surging into the area hauled away stone, bricks and wood to build their farmhouses. When the stagecoach and railroad bypassed the site, the fort was officially dead. Eventually it was sold to cattleman John Prowers, a former employee of the Bent brothers, who used it as a cattle stockade. In 1912 the La Junta Daughters of the American Revolution erected a commemorative arch which still stands near the site of the old fort. They broached the subject of preserving the fort. In 1954, the state of Colorado bought the site for the Colorado Historical Society, which commissioned an archeological dig. In 1960, President Dwight Eisenhower authorized a national historic site at Bent’s Old Fort and more digging ensued. Later that year the fort was also named a National Historic Landmark. After much spirited argument, in 1974 President Gerald Ford authorized reconstruction of the fort. Working from excavated paintings and journals describing the fort, workers made 160,000 adobe bricks on the site, craftsmen hand-cut 800 cottonwoods to support the roof and crafted frames for doors and windows, and blacksmiths working in the reconstructed blacksmith shop made the hardware for the fort. In addition, the overgrazed prairie, planted for decades with irrigated crops, is being returned to its original state. The fort opened to the public in 1975. Bent’s Old Fort is open every day except for Thanksgiving, Christmas and New Year’s Day. Hours vary by season. The entrance fee is $3 for adults, $2 for children 6 to 12 and free for children under 6. 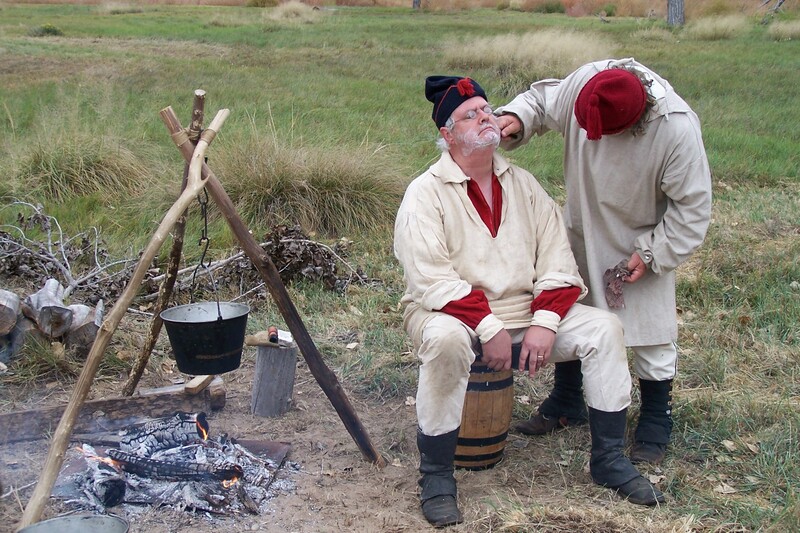 A 20-minute movie takes visitors through the history and significance of the fort, and costumed interpreters lead tours and demonstrate the daily skills of 15 decades in the past. Special events include a chance for kids to take on the role of a character from the fort’s past, a wagon ride along part of the Santa Fe Trail, gatherings of “fur traders” and a tribute to Hispanic culture. A train ride from La Junta to Albuquerque, N.M., and back includes a narrative about the route. During the Christmas season there are nighttime candlelight tours of the fort. To access the park by car, take U.S. 50 from La Junta to Colorado 109 north to Colorado 194 east, about eight miles in all. From the parking lot it’s a quarter-mile walk to the fort itself. A phone at the parking lot will summon a shuttle. The ground floor areas of the fort are accessible to wheelchairs. No food or drink is available.